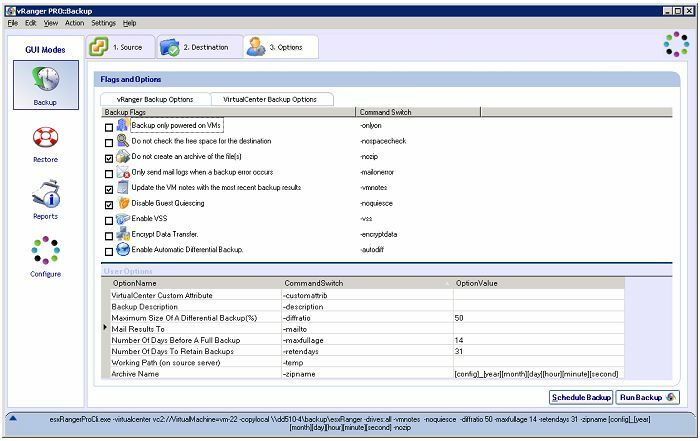 As I’m sure most of you know, vRanger is a backup application that protects virtual machines hosted on VMware ESX servers. Data Domain appliances provide a storage solution which reduces the data storage requirements via inline data deduplication. The Data Domain appliance, in this case, is configured to present itself as a Windows server (BACKUP01) and serves as the target for the vRanger backups. Together, vRanger and Data Domain storage appliances can achieve very high levels of compression, as much as 100x or higher compression ratios are possible. However, to realize these ratios in a production environment, specific configuration settings must be applied. Let’s talk about the desired vRanger installation and configuration settings for optimal Data Domain compression and performance. Data Domain strongly recommends applying each of these configuration modifications, as data compression can be severely limited if they are not. 1. On BACKUP01, create a subdirectory in /backup to contain the backup data. For example: \\BACKUP01\backup\vmbackups. If a backup job is submitted directly to /backup, it may not start properly. 2. In vRanger, specify the Data Domain UNC path as the Backup destination. To ensure optimal compression on the Data Domain appliance, always perform uncompressed backups by enabling the -nozip command switch. In the vRanger GUI, check the Do not create an archive of the file box. Failure to use the –nozip command switch results in extremely poor compression. At this point, you may perform a test backup and view the vRanger backup directory on the Data Domain system. If a single zip file is seen, the –nozip option is not set properly. Perform Full backups. Differential backups are not needed with Data Domain, as storage savings are realized through the data de-duplication compression technology. Set the Archive Name option to create unique directories for each full backup to avoid overwrites, which may severely degrade the compression ratio. The ideal setting can be done quickly by checking and then un-checking the Enable Automatic Differential Backup option. The Archive Name option should be set to [config]_[year][month][day][hour][minute][second]. 4. Schedule the backup job as required by your environment. 5. Should a restore be necessary, the Restore process of a de-duplicated backup is no different than that of an “regular” backup. Click on Restore within the vRanger GUI to perform the restore process.